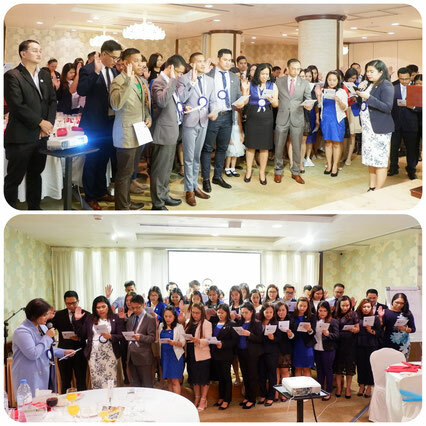 Philippine Institute of Certified Public Accountants (PICPA) Abu Dhabi Chapter’s 16th anniversary and induction of officers, members and associates was celebrated on September 21, 2018 at the City Seasons Hotel in Abu Dhabi, UAE. The successful event was attended by a total of 106 participants, 89 of which are PICPA Abu Dhabi members. There were two main apportionments of the gathering, the first one was the technical session entitled “Updates, Clarifications and Correction of Errors on Value Added Tax in the UAE; the second one was the oath taking ceremony. The event officially kicked off with a warm welcome address by the PICPA Abu Dhabi’s Executive Vice President, Mr. Johann Salangsang. The PICPA Abu Dhabi was very fortunate to have its active member and previous officer, Mr. Arnel Gagani, CPA, as the lecturer for the very interesting subject of VAT in the UAE. Mr. Gagani was so engaging in his way of delivering the topic and also very adept at his own chosen field of expertise. After the productive discussion of the speaker and the session participants, the event came into a short halt to give way for the dinner and for everyone to have more chance of socializing. When everybody was full, the second part of the program started with the President’s Report delivered by the FY 2017-2018 President himself, Mr. Silveriano Prieto, Jr. Mr. Prieto’s report aimed not just to show the outstanding accomplishments of the 2017-2018 term, but also to inspire, motivate and challenge the incoming officers, members and associates of the PICPA Abu Dhabi. After the President’s Report, the event’s guest of honour shared a very heart-enriching message. The Philippines’ Second Secretary and Consul to the UAE, Rowena Pangilinan – Daquipil, stood in front of everyone and as always, never fails to leave a great impression to those who are lucky enough to listen to her message. When all the encouragements were already given, the formal oath-taking of the PICPA officers was conducted by Consul Daquipil, followed then was the inaugural speech of the FY 2018-2019 PICPA Abu Dhabi President, Mrs. Maria Sharina De Dios. Mrs. De Dios’s speech exhibited that she is willing to offer a sincere, strong and exemplary leadership to PICPA Abu Dhabi. Thereafter, it was the members’ and associates’ turn to take their oath which was overseen by Mrs. De Dios. Distinguished guests were Consul Daquipil, PPO – UAE Chairman Engr. Bernie Favorito and Vice Chairman Judith Tenorio. The event was also graced by PICPA Abu Dhabi’s former Presidents: Alfred Geronimo, Willard Macquirang, Albert Prieto, Marybeth Junio and Silveriano Prieto, Jr. Success of the anniversary celebration would have been hard if not for the PICPA Abu Dhabi partners: Universal Hospital, CPARME, SMDC, LBC, Nasser Auditing Services and Business Management, Golden Box Corner Cargo, Original Litson Manok, Shinagawa Lasik and Aesthetics, Off the Hook Seafood Restaurant, and Kabayan Weekly. “PICPA Abu Dhabi is not just an organization, it is my family.” These words spoken by Miss Diana Mabborang in her closing remarks will always live true inside the hearts and minds of PICPA Abu Dhabi members, wherever they are and whatever they may be going through.